Angelika Seeschaaf Veres is a German-born designer based in Toronto since 2011. She launched her own design studio eeaa design in 2004. She has cycled since she was five years old, in Berlin, Amsterdam, London and now Toronto. For the Pretty Shiny Things exhibition, her first in Toronto, she created a line of reflective cycling gear for women that rides the line separating fashion and safety. Her Reflect/Respect collection was designed with Toronto's specific biking conditions in mind, to promote cycling and safety in our city. Some of the items are available to purchase through Etsy. Why did you start making this collection of cycling clothing? I always found that there was no nice cycling wear, especially for women. I don’t like to wear the geeky bike jackets, I’d like to buy something that I could wear off the bike. I also wanted to get away from the “safety look” that these construction vests have. I tried to push the boundaries of this reflective material, it's usually just applied in stripes, but I wanted to see what else you could do with it. I actually find cycling in Toronto pretty hard, because the cars don’t show respect; hence the name of the line, Reflect/Respect. dandySWAG page from issue 10 of dandyhorse, featuring some Reflect/Respect DIY iron-ons. Image by John Lee. I decided to use grey for this collection because I wanted the subtleties of the material to make it look like embroidery. The inside of the cape is quite bright. It’s a three season garment, it's waterproof and has the functions you would want a bicycle garment to have. With the accessory range, like the snood, I wanted to play with the subtleties. When you get hit with the headlight of a car, the 3M scotch lite thread knitted into it really shines up. The idea is that you can wear it as an everyday item, it’s not apparent that it's a safety garment in itself. These are the boundaries I tried to push with the collection. What's your experience with being “fragile” on a bicycle? Were you ever hit? Yes, in London. I have a pannier bag and it was full of spray cans and other items because we were just setting up an exhibition. The pannier actually saved my leg, I fell on that side when I got hit by the car. The more direct messages like “Fragile” and “Share” are reflecting my experience here in Toronto. In Berlin or in Copenhagen that wouldn’t work, because the infrastructure’s already set up for cyclists. You don’t need to get these messages moving throughout the city. With the DIY aspect of the motifs, the more people wear them, the more awareness you can create. They can become like moving billboards to promote cycling. I am a product designer, I can’t build more cycle paths, even if I want to. But I think as a designer you can still pose questions and raise awareness for things you feel are important. 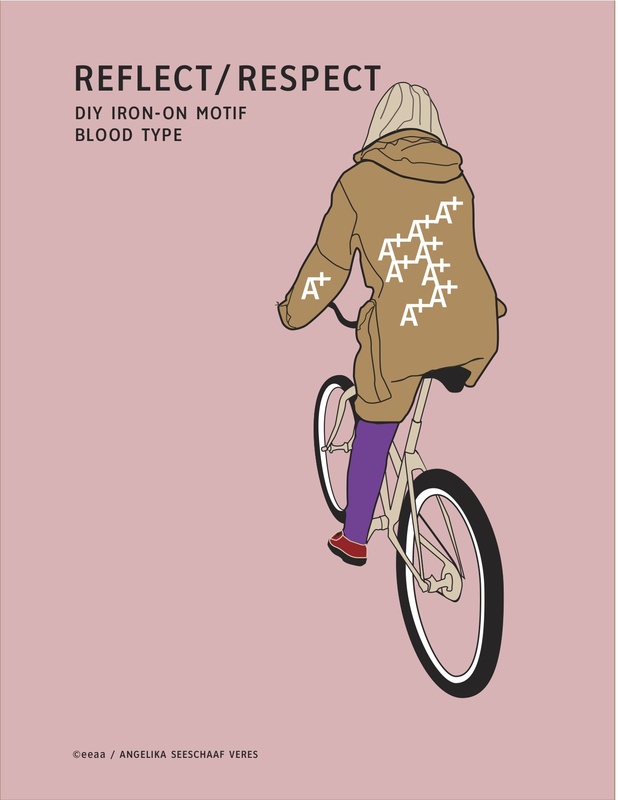 How did you come up with the idea of putting blood type patterns on the clothes? I could have used any pattern, but then it just becomes random -something I can’t do. So I thought more about it, and the blood type came up. I played around a lot trying to find the right patterns where it would look almost like jewelry or embroidery, but still readable as your blood type. There’s this ambiguity when you don’t know what it is, it’s just a nice pattern on clothing. But when you realize what it means, the message becomes a bit more morbid and changes the garment completely. 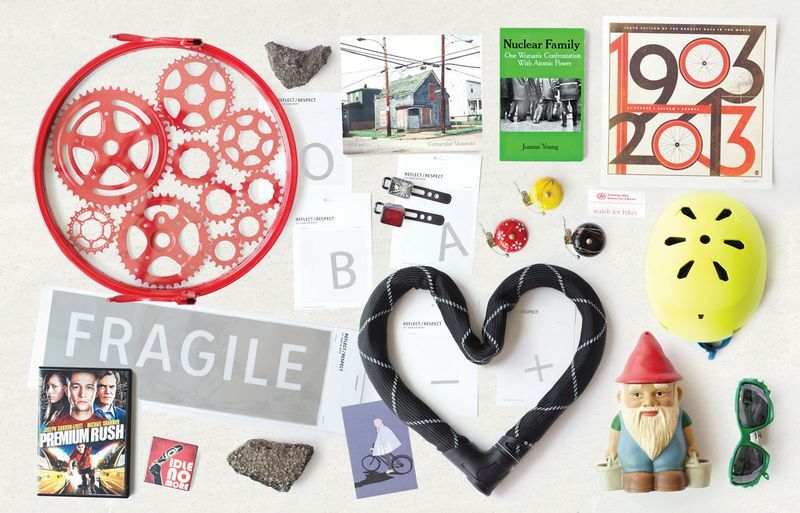 A sample of the blood type patterns you can create from the Reflect/Respect collection. 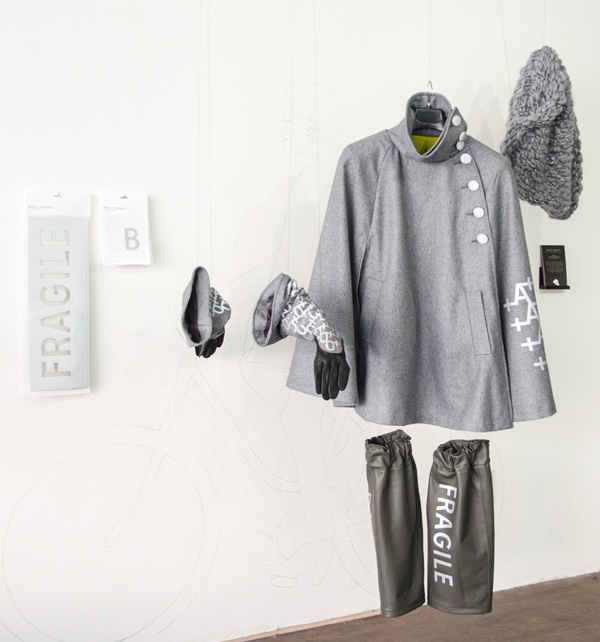 Designer Angelika Seeschaaf used her own blood type (A+) on the prototype pieces. I really enjoyed doing this collection and I’d like to push it further. I have many more ideas, especially for the summer. This was more of an autumn, winter and early spring collection, but for the summer I’d like to do some more bags and jewelry. I'd like to create some jewelry that you could wear throughout the day, but that would also become reflective as you cycle at night. You would be able to wear it over the sleeve of a coat. That’s something I’d like to take much further. Why did you decide to target women in particular? First of all, female cyclists here are a minority, only 20 or 30% of people who cycle are women. Obviously the DIY adhesives work for both genders. but I wanted to push cycling clothes high end and get away from the things you would by at MEC or Adidas or Nike. As a female cyclist I have different demands on fashion than men. I don’t want to carry around my nice coat, and on top of it something else that keeps me safe or dry. I wanted to fuse the two together. The point I wanted to make was that cycling clothes don’t need to look geeky. I was looking at the actual cycling injury stats in Toronto, and I had already done some research in London. I found that there’s one particular kind of accident that seems to happen a lot to women. They often get cut off turning right or left. 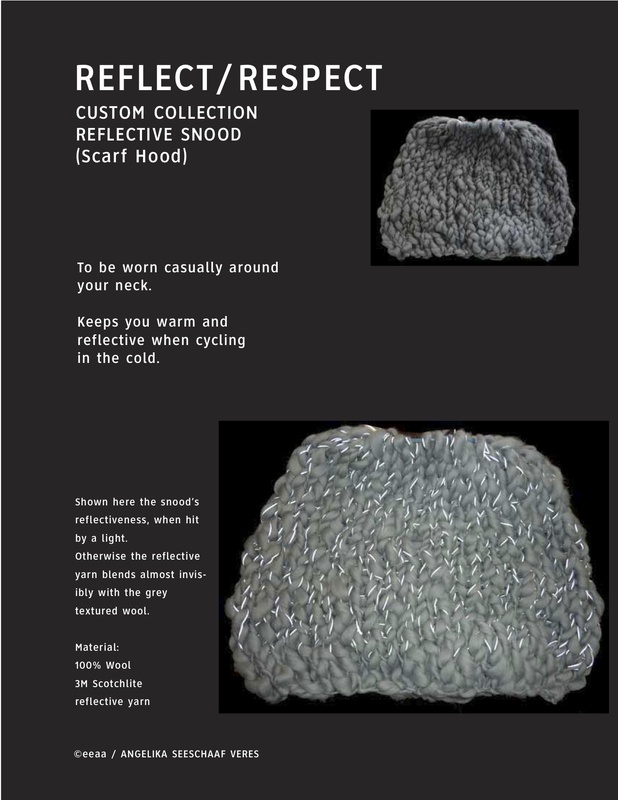 I created the cape to enhance the presence of female cyclists on the road. When you move with the cape, the sides flare up and make it appear bigger. There’s supposedly a psychological impact, that when you look bigger people will give you more room. Also, if you ride further from the curbstone, drivers tend to give you the same distance on the other side. However, H&M just came up with a bike range. Also 20’s inspired, for men. They developed it together with the Brick Lane Bike store in London, I actually know them. So it’s basically the same concept, to get cycling items which can go both ways, so they don’t look like cycling wear, but you can wear them on the bike. I have many more ideas for a line of bike clothes for men. I would approach the idea of enhancing the male presence on the road quite differently. Vespertine NYC is another example of fashionable reflective bike-friendly clothing designed for women. Do you feel safe biking in Toronto? No. There aren't enough cycle paths. When you're on the cycle path it’s fine, but cars still tend to cut you off. I don’t think a lot of them are aware that if they hit a cyclist, it’s always their fault. By law, the car is a weapon. The bike isn’t. But that’s just part of it. Being in North America, it is a car-based culture and the cities are built from scratch for the car. However, the same was the case in Copenhagen 20 years ago. And they just took the space away from the cars and turned the roads into bike routes and now 50% of the population is cycling, even though they have the same climate conditions as here. People do it, it’s not a big deal. One thing I would do to make it safer? Give more space to cyclists. You really have to change the urban planning grid. It’s not a solution you can do in patches, you really need to rethink the city. 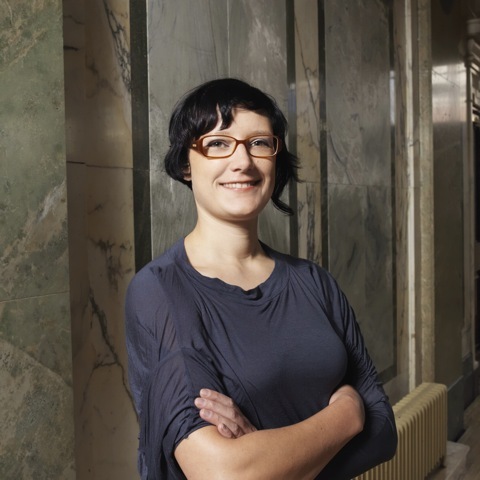 Portrait of Angelika Seeschaaf by Elke Meitzel. Pick up a copy of the Summer 2013 safety issue for more on Angelika and her Reflect/Respect line, featured in our dandySWAG collection! Behind the scenes of "Lock 'n' Roll"